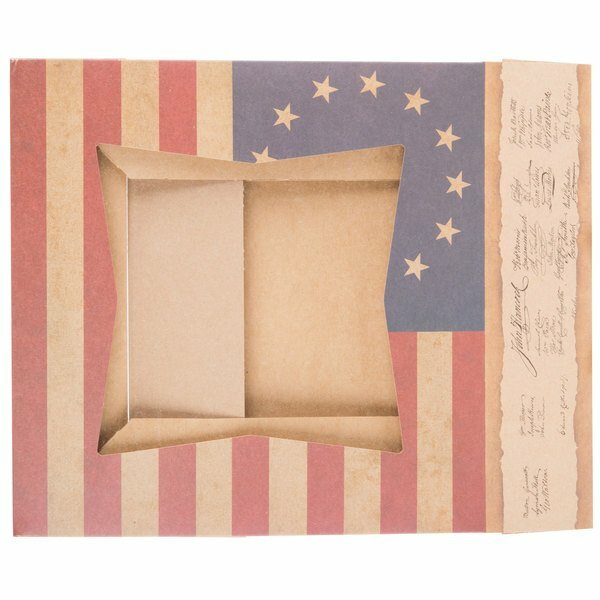 Watch your delicious baked goods soar out of the door with this 10" x 10" x 2" window cake / bakery box with vintage American flag / declaration of independence design! 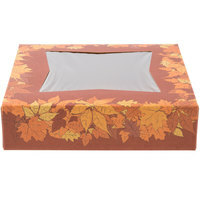 This box is a great way to offer your delicious cakes, cupcakes, or other baked goods on the go for customers. Its auto-popup design saves time and makes assembly quick so that you can offer fast and efficient service at your bakery. 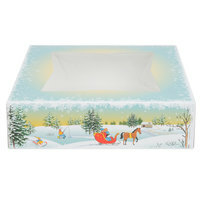 The viewing window also displays the product for quick and easy identification. 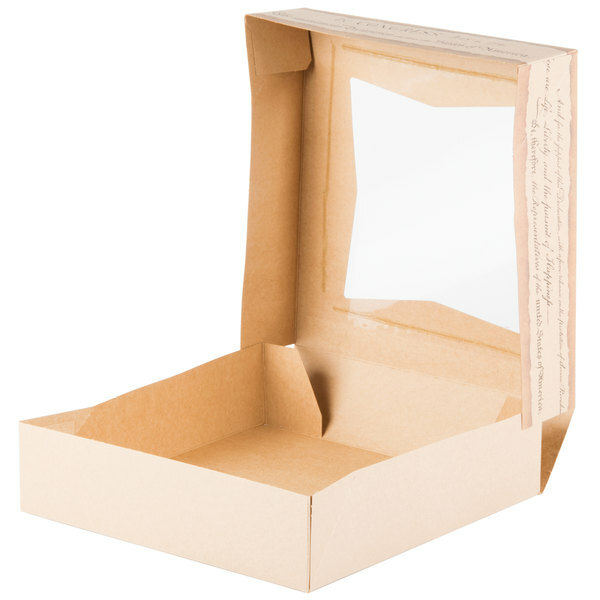 Once the window is removed, you can recycle this box, making it a great eco-friendly option for your business. "These are the best bakery boxes we've ever worked with. It saves so much time to have the boxes pre-folded instead of flat. They're sturdy, so we were able to stack our pies 4 high. 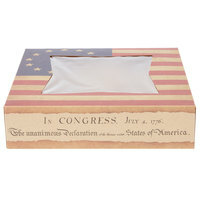 Great product with a patriotic message. These were just what we needed for our 4th of July fundraiser." 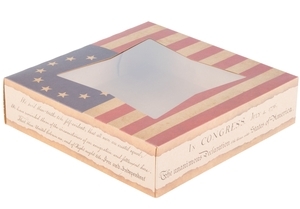 Made of durable kraft paperboard, with a patriotic print on the outside and natural brown on the inside, this convenient, time-saving bakery box is built strong to ensure your items are protected while on display or in transport. This bakery box comes preassembled but is flat, ensuring that it's easy to store and takes up less space. The innovative auto-popup feature lets the box expand in seconds, eliminating time wasted on assembling traditional fold-and-lock boxes. Featuring a crystal clear viewing window for optimal visibility, this box puts your delicious treats front and center for a mouthwatering display. Plus, it allows your customers to easily identify the contents as they transport the box to their next destination! 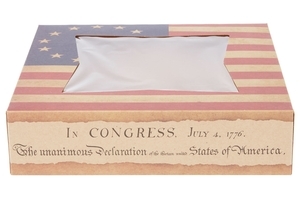 Plus, its American flag / Declaration of Independence design is perfect for Labor Day bake sales, Fourth of July treats, and other celebratory confections. 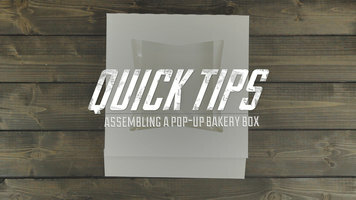 To assemble a pop-up bakery box, flip open the flat box and pop up the corner tabs. Then, expand the lid and fit the top of the box over the bottom. In only a couple of seconds, your box is ready to fill! 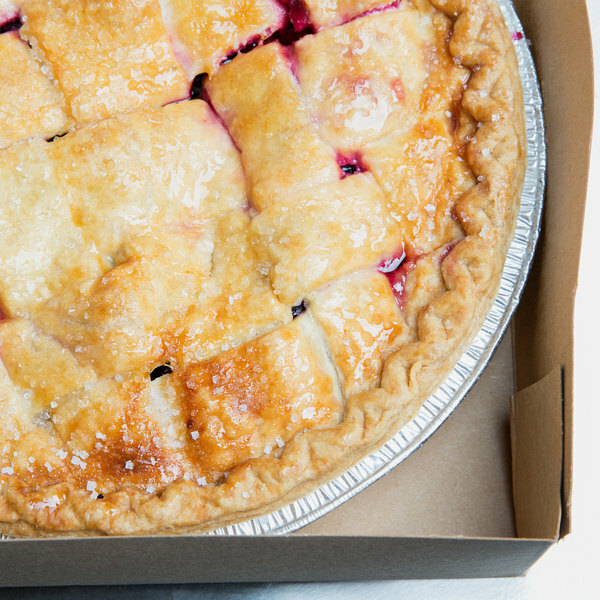 These are the best bakery boxes we've ever worked with. It saves so much time to have the boxes pre-folded instead of flat. They're sturdy, so we were able to stack our pies 4 high. Great product with a patriotic message. These were just what we needed for our 4th of July fundraiser. Love these pie boxes. The American Flag adds a nice touch to the box so it is not plain white. They box themselves are very great quality. Great price as well.